Thanks for sharing. Which OS(s) have you used on it and what has been your main use for it? Hi MikeREM, I’ve reinstalled Neon and turned off sleep mode. Still not working 100% but it’s ok. I bought it as an Xmas present for my 8 year old grand. A good starter lappy I think AND into the world of linux… Fingers crossed! I bought the 14’’ version last year and first the headphone jack and then the charging port went out. I also experienced hairline cracks in the case. If you’re giving this to an 8 Y/O I would recommend getting them a longer charging cable and telling them to be careful about pulling on cables - although let’s be honest, that’s likely going to happen anyway. Should definitely get a case to put it in too. Also, if he’s going to be running a web browser, you should install the great suspender extension. It’ll keep his new toy from chugging. (Assuming gender here lol) If the headphone jack breaks you can just grab a usb sound card, worked perfectly with mine. Just remember he won’t be running many games on it (minetest barely pushes 7 fps) Otherwise, if all you’re doing is browsing the web, this laptop does it fine, it can also handle video playback as well. Hope it works out great! I don’t have any kids, so no concern there. Never heard of the great suspender extension. Just added it. Thanks for the suggestion! Hopefully that will help speed up the sluggish browsing I’ve experienced thus far. Sorry, was kind of talking to @abw up there for all the “Young person” suggestions. Youtube never seemed to be that bad to me. I was using the stock ubuntu mate though, I don’t know if that makes a difference. For your playback problems, maybe chromium on different distro change this?.. I know it sounds stupid, but for example on my pi top I previously used raspbian with chromium. Every time I clicked chromium to open, CPU was very high (80-100%). Same machine, but with dietpi + GUI + chromium and CPU gives results 14-30% on the same operation. YT increases CPU load to 50-60%. Movies are / was played fluently on both raspbian and dietpi. Thanks, I’ll give that a read and see if there’s anything I can learn from it. Just a brief update: While I’m still struggling to find ways to improve the performance of the Pinebook with KDE Neon, I’ve just used the it to install DietPi on the SD card for the Raspberry Pi for my bearded dragon (yes that’s right, she has her own little PC to watch nature videos for enrichment ). Anyway, if DietPi runs well and plays/streams videos well for the Pi, then I might go ahead and install DietPi on the Pinebook as well and give that a try. Another brief update: My RPi 2B seems to still struggle even running DietPi. Youtube video playback was actually worse when running Chromium in LXDE. When I tried having it boot just straight into Chromium (no DE), it was “better” but still pauses intermittently every few seconds. I’m wondering if the RPi 2B just isn’t powerful enough by today’s standards to handle streaming video playback…? Was only trying to run 480p. The Pinebook is more powerful in very way, so I still may try DietPi on it just for curiosity. Looking at the specs at first glance it looks like it should be enough. But on the other hand, I remember having issues having more than 2 tabs (no videos) in a browser on a DE with my Raspberry Pi 3B. I assume that the RAM is the issue (and it doesn’t help that browsers usually have issues, too). The CPU clearly should handle this task, but nowadays the RAM usage is very high for browsers, especially since the Spectre scandal, etc. I don’t know if the patches are basically so much built into the core of the browsers, that maybe the ARM versions have it, as well. Firefox on my desktop computer takes easily 5-6GB of RAM on its own. Now imagine a little Raspberry Pi having to playback a video + having the DE open, etc. Maybe there is a way of limiting RAM usage for certain apps, I don’t know. I just know and use cpulimit which can limit CPU time for apps. Try to see how well it plays videos offline. If you want to be also more efficient in detecting common issues, you should monitor RAM + CPU usage before, during and after playback. Despite everything said, there is also a very tiny possibility that your device might have a hardware issue. It happens very rarely, but it is definitely not impossible. If everything software side is unclear and you can’t detect the issue, then monitor temperatures, check voltages, etc. Ah, speaking of voltages, you have to make sure that your AC adapter actually delivers the 2A (or whatever the 2B needs) to the device. Just because it says it does deliver that, it doesn’t mean that it’s actually true. As I found out myself, changing to a more powerful AC adapter can move worlds. I have a Raspberry Pi, that hangs on boot and does not continue to boot. Once I change the PSU, it works flawlessly. Was only trying to run 480p. Is related to the bandwidth and not the hardware power. If the WiFi is broken or something then it could be a bandwidth issue, not a power issue. Play the video offline, as recommended above to be sure it’s not bandwidth related. it was “better” but still pauses intermittently every few seconds. If this only happens during online streaming (you have to try out several online streaming services to confirm realiably) and not or almost never offline, then you only have a bandwidth issue. Just plug in a working LAN cable and you’re done. 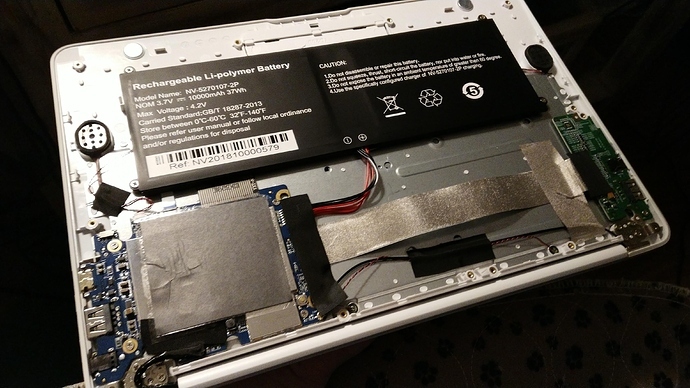 Just posting a pic of the insides of the Pinebook. Took the back off yesterday just for curiosity. The Pine64 SOC board is so tiny compared to the battery, lol. 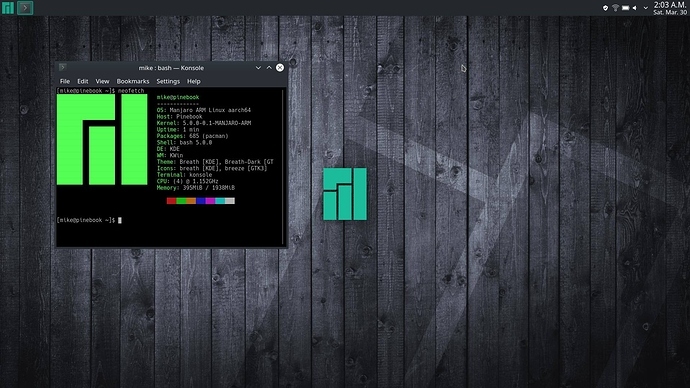 Also I’ve been experimenting with other OSs on this device and it seems as though Manjaro ARM KDE is better-suited for this device than the KDE Neon it ships with. Running it off the SD card and already it feels snappier and less clunky to use. The wifi isn’t working after the latest update however, so just waiting on a fix for that in the next upgrade patch. Manjaro to the rescue!!! Installed to the eMMC storage of the Pinebook and finally it now feels like I can actually use this device as intended! Now I can actually give it a fair and proper review. My, what a difference it made. The devs over at Manjaro have done a fine job with ARM KDE.